قائمی, نرجس, دردل, مرتضی, قاسمی, محمدحسن, ظهور, حسن. (1393). عملکرد سینماتیکی و دینامیکی مکانیزم زانوی مصنوعی شش‌میله‌ای. نشریه پژوهشی مهندسی مکانیک ایران, 16(1), 43-55. نرجس قائمی; مرتضی دردل; محمدحسن قاسمی; حسن ظهور. "عملکرد سینماتیکی و دینامیکی مکانیزم زانوی مصنوعی شش‌میله‌ای". نشریه پژوهشی مهندسی مکانیک ایران, 16, 1, 1393, 43-55. قائمی, نرجس, دردل, مرتضی, قاسمی, محمدحسن, ظهور, حسن. (1393). 'عملکرد سینماتیکی و دینامیکی مکانیزم زانوی مصنوعی شش‌میله‌ای', نشریه پژوهشی مهندسی مکانیک ایران, 16(1), pp. 43-55. قائمی, نرجس, دردل, مرتضی, قاسمی, محمدحسن, ظهور, حسن. عملکرد سینماتیکی و دینامیکی مکانیزم زانوی مصنوعی شش‌میله‌ای. 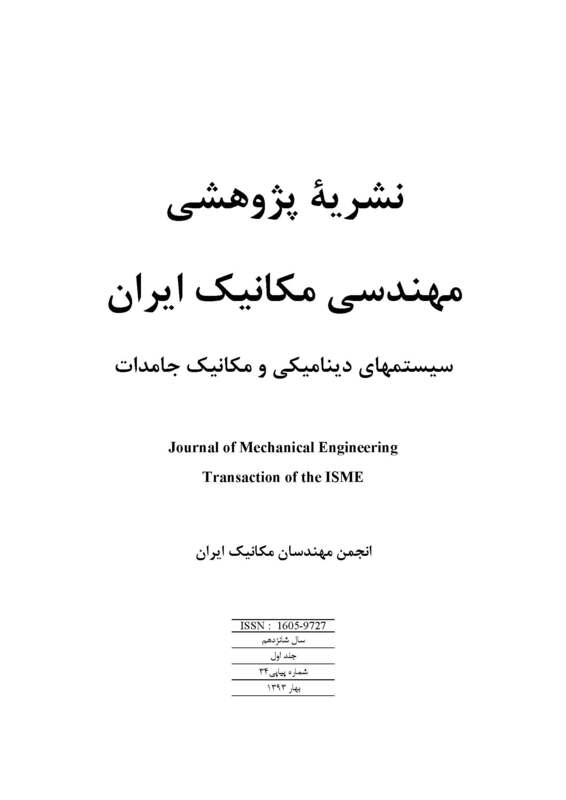 نشریه پژوهشی مهندسی مکانیک ایران, 1393; 16(1): 43-55. قطع عضو شدن از ناحیه پا، از دیرباز یکی از مشکلات انسان در طول تاریخ زندگی بشر بوده است. بنابراین طراحی درست و بهینه مکانیزم پای مصنوعی و بالاخص، پروتز زانوی مصنوعی پایدارتر، شکیلتر و کم‌مصرف‌تر از نقطه نظر گشتاور اعمالی به سیستم، برای این دسته معلولان می‌تواند بسیار مفید واقع شود. در این مطالعه انواع مکانیزمهای زانوی شش‌میله‌ای از دیدگاه سینماتیکی و دینامیکی مورد بررسی قرار گرفته و بهبود و تضعیف عملکردشان با هم مقایسه می‌شوند، و مکانیزم زانویی که بهترین عملکرد سینماتیکی و دینامیکی را همزمان ارائه می‌دهد به عنوان مکانیزم زانوی بهینه انتخاب می‌شود. Radcliffe, C.W., and Deg, M., "Biomechanics of Knee Stability Control with Four-bar Prosthetic Knees", ISPO Australia Annual Meeting Melbourne, November, (2003). Radcliffe, C., "Four-bar Linkage Prosthetic Knee Mechanisms: Kinematics, Alignment and Prescription Criteria", Prosthetics and Orthotics International,.Vol. 18, No. 3, pp. 159-173, (1994). Öberg, K., "Knee Mechanisms for Through-knee Prostheses", Prosthetics and Orthotics International, Vol. 7, No. 1, pp. 107-112, (1983). Srinivasan, S., and Reddy, V.V., "Design and Analysis of a Knee Mechanism for Knee-ankle-foot Orthosis". Torfason, L., and Hobson, D., "Computer Optimization of Polycentric Prosthetic Knee Mechanisms", Bulletin of Prosthetics Research, Vol. 10, pp. 187-201, (1975). Gong, S., Yang, P., and Song. L., "Development of an Intelligent Prosthetic Knee Control System", in Electrical and Control Engineering (ICECE), International Conference on Wuhan, (2010). Kim, K.J., Wu, C.D., Wang, F., and Wen, S.G., "The Research of the Four-Bar Bionic Active Knee", Advanced Materials Research, Vol. 308, pp. 1988-1991, (2011). Hamon, A., and Aoustin, Y., "Cross Four-bar Linkage for the Knees of a Planar Bipedal Robot", in Humanoid Robots (Humanoids), International Conference on Nashwille,TN, (2010). Farhat, N., Mata, V., Rosa, D., and Fayos, J., "A Procedure for Estimating the Relevant Forces in the Human Knee using a Four-bar Mechanism", Computer Methods in Biomechanics and Biomedical Engineering, Vol. 13, pp. 577-587, (2010). Van Oort, G., Carloni, R., Borjerink, D.J., and Stramijioli, S., "An Energy Efficient Knee Locking Mechanism for a Dynamically Walking Robot", in Robotics and Automation (ICRA), IEEE International Conference, Shanghi, (2011). Chakraborty, J., and Patil, K.,"A New Modular Six-bar Linkage Trans-Femoral Prosthesis for Walking and Squatting", Prosthetics and Orthotics International, Vol. 18, No. 2, pp. 98-108, (1994). Jin, D.,Zhang, R., and Dimo, H., "Kinematic and Dynamic Performance of Prosthetic Knee Joint using Six-bar Mechanism", Journal of Rehabilitation Research and Development, Vol. 40, pp. 39-48, (2003). Font-Liagunes, J.M., Pamies-Vila, R., Alonso, J., and Lugris, U., "Simulation and Design of an Active Orthosis for an Incomplete Spinal Cord Injured Subject", Procedia IUTAM, Vol. 2, pp. 68-81, (2011). Low, K., "Subject-oriented Overground Walking Pattern Generation on a Rehabilitation Robot Based on Foot and Pelvic Trajectories", Procedia IUTAM,.Vol. 2, pp. 109-127, (2011). Vaughan, Ch. L., Davis, B.L., and O”Connor, J.C., "Dynamics of Human Gait", Second Edition ed, South Africa, Mills Litho, Cape Town, (1999).